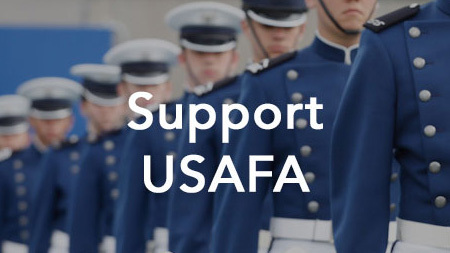 The Olmsted Foundation supports cultural immersion for undergraduate students at the U.S. Air Force Academy, the U.S. Naval Academy, the U.S. Military Academy and four other institutions. In 2018, 25 USAFA cadets fanned out across the globe in four different teams, collectively visiting 11 countries. The trips enabled them to gather firsthand information on a variety of issues, from examining political conflict and Russian influence in Southeast Europe, to exploring U.S. Southern Command's humanitarian mission in Panama, to studying post-conflict economic issues in Rwanda and Uganda and experiencing cultural diversity in West Africa. During the in-country immersions, cadets also met with Air Force and defense attaches and embassy leaders. Five cadets explored the culture and history of Panama. The trip included visiting historic sites like the Panama Canal and a journey by canoe to an indigenous tribal village. “We were able to learn so much in eight days and will be able to apply it to future NH operations and partnerships with the country of Panama,” said Cadet 1st Class Knykia Franklin. 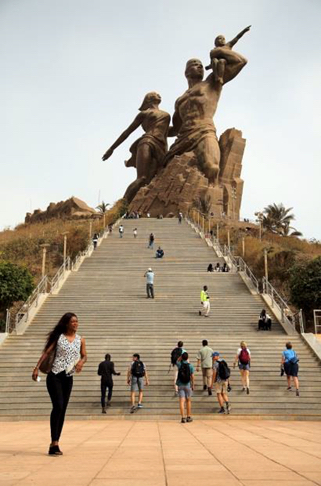 A continent away, six cadets visited five countries in West Africa: Senegal, Gambia, Liberia, Cote d’Ivoire and Ghana. The trip made a lasting impression on Cadet 1st Class Georgia Sims, who had recently been accepted to medical school. 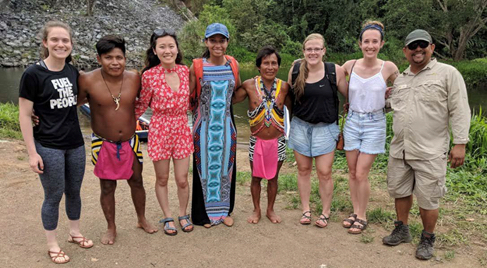 “I have a desire to become a physician for the Air Force, so this trip had a huge impact on my global perspectives as a future Air Force officer and doctor,” she said. Sims had an opportunity to meet a physician in Liberia who had tackled the Ebola crisis working with USAID. The challenges of managing healthcare in the developing world especially hit home when the team visited the slums of West Point Township in Monrovia, the capital of Liberia. 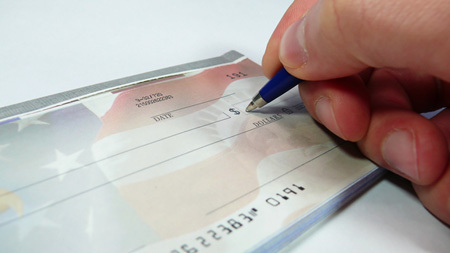 “I knew that we were going to see poverty, but this was incredibly sad,” Sims said. “The image of the amount of people that were crunched together in a small spot just trying to live will never leave my mind. I remember the smell and the filth that was normal to these people. I will also remember watching a little kid rinse his toothbrush off in the little, black, runoff stream in the middle of the road. The brutal conflicts that engulfed the Balkans in the 1990s formed the backdrop for a team of six cadets to delve into complex issues of ethnic rivalries, war and reconstruction in Serbia, Montenegro and Bosnia/Herzegovina. From interacting with students and meeting with the dean of the faculty of political sciences at Belgrade University to visiting the Museum of the Siege of Sarajevo to meeting with the CEO of the Atlantic Council of Montenegro, the cadets gained valuable insights. “By actually visiting the country, you get the international perspective,” said Cadet 1st Class Diana Myers. “In the Balkans especially, I truly believe that you can only understand the complexity of their geopolitical environment after visiting there, interacting with the locals, and making the effort to learn the culture. Pursuing a profession that relies on my ability to work with foreign members and operate on foreign soil, these types of immersion programs are essential in promoting interoperability with people who come from different backgrounds." A fourth team of cadets visited Uganda and Rwanda, exploring the challenges of sustaining economic development in nations that have experienced devastating rebellions, genocide and dealing with an influx of refugees from neighboring nations. Cadet 1st Class Ciera White was moved by the humanitarian impact that armed conflicts have on communities. “As a cadet, I think it is easy to become isolated from the world,” White said. “This trip forced me to contemplate the role that the United States plays, and should play, in fighting extremism overseas. For 2019, 52 cadets are preparing for summer cultural immersion trips to 15 countries in South America, Africa, Asia and Europe. On a graduate level, the Olmsted foundation supports a two-year cultural immersion experience for military officers and their families called the Olmsted Scholars Program. Scholars pursue graduate studies at a foreign university, taught in the language of the country. 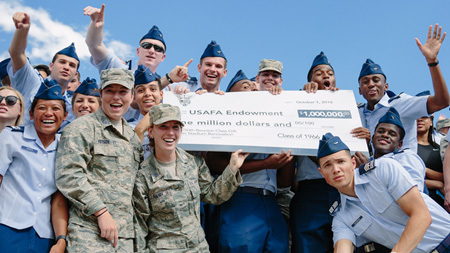 More than 600 Olmsted Scholars, including 225 Air Force officers, have studied in over 200 universities in more than 60 countries. Col. (Ret.) 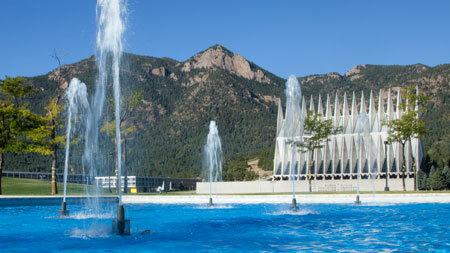 David Estep '78, executive vice president of the Olmsted Foundation, recently visited the Air Force Academy. 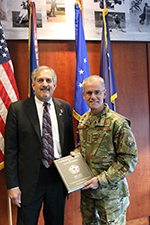 Estep presented Academy Superintendent Lt. Gen. Jay Silveria ‘85 with a copy of The Register of Scholars & Foundation Officers: 1960-2019, along with a challenge coin from the foundation.